Holstein cows. Their milk is delicious if you’ve got the right enzymes. Americans are drinking less and less milk over time, and the U.S. Department of Agriculture wants to know why (PDF). A bit oddly, the report does not mention the word “lactose,” though lactose intolerance is certainly the reason you won’t see me drinking any fluid milk. 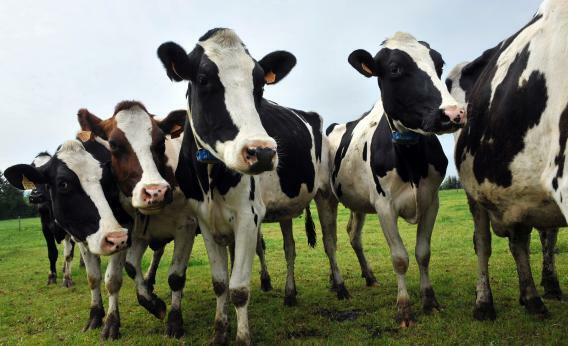 The entire federal government seems to be sufficiently locked down by the dairy industry to completely ignore this subject, since the report goes on in parts about the allegedly dire health implications of this waning milk enthusiasm rather than simply focusing on the economic implications. But when I first saw the headline, I thought the answer was going to be as simple as the declining white share of the population driving declining milk consumption via the mechanism of lactose intolerance. But the Agriculture Department people did a fairly sophisticated statistical analysis and that’s not the case. They have a multivariate analysis that shows that being black or latino is indeed negatively correlated with milk consumption, but there’s a statistically significant cohort effect that remains even when you control for basic demographic variables. Basically, younger people are drinking less milk and it’s not totally clear why. My suspicion would still be that the lactose intolerance issue deserves some direct scrutiny. White people are less likely to be lactose intolerant, but it’s a more complicated issue than that. To study it, though, the agency would first have to acknowledge that the issue exists.